After one week of open registration, Central Mass 6 already has over 125 riders signed up with more flowing in every day. The official promo video has just dropped, and is intended to fill-you-in on all of the major event details for 2015. Just like last year, it keeps the theme of Trailer Park Boys, unnecessary leathers, and confusing plot twists. Although the event will take some time to sell out… it always does sell out! Make sure to lock down your spot before it’s too late at http://skatecentralMA.com/registration. *something something early skatebird gets the stokeworm* If the excellent times aren’t convincing enough, there will be $5,000 in cash prizes, 300 free event t-shirts, 250 posters, hats, assorted merch and tons of gear prizes. Learn more registration info on Wheelbase’s “REGISTER NOW!” post and our first general info article. 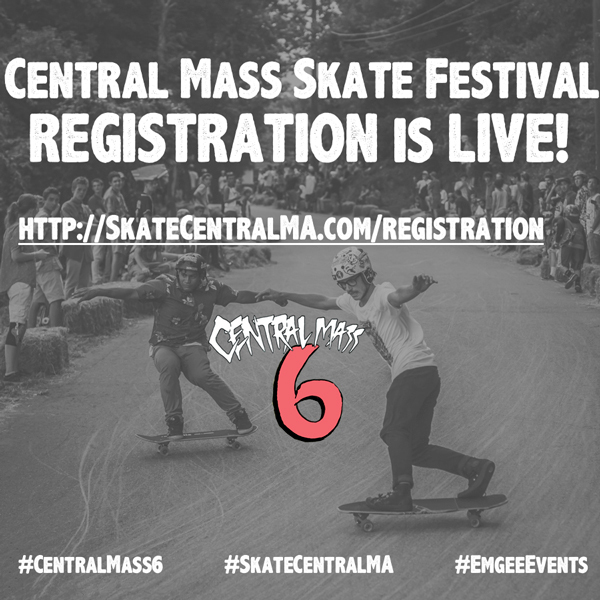 Central Mass Skate Festival increasing its focus on being as environmentally sustainable as possible in 2015. Registrants are asked NOT to print paper tickets, and will instead be checked in digital. There will be free water for those who bring reusable containers (no plastic single-use bottles), and the event has made a conscious effort to partner with environmentally-conscious brands like: Comet Skateboards, ENO, Tecnu & iNi Cooperative. There is a special lodging discount for event-affiliated guests at the Springhill Inn & Suites in Devens, MA. Book your stay at http://bit.ly/CM6hotel; discounted rates and reserved rooms are held until 2 weeks before the event. Learn more here. 12:00pm – Mini ramp open skate, street course open skate & rider check-in begins. Free event shirts for the first 300 skaters to check in! Posters, hats & raffle tickets available for purchase. Raffle benefits Harvard Ambulance Squad. $2,000 prize purse; $75 entry. BBQ, Food & Drink for purchase from HGS. Free water*! $2,000 prize purse; $45 entry. BBQ for purchase from HGS. Free water*! Raffle benefiting Harvard Ambulance Squad. 9:00am – Buses shuttle riders to the slide jam hill. NO parking at the slide hill!